With urban areas growing worldwide, so does artificial light at night (ALAN) which negatively affects many nocturnal animals, including bats. The response of bats to ALAN ranges from some opportunistic species taking advantage of insect aggregations around street lamps, particularly those emitting ultraviolet (UV) light, to others avoiding lit areas at all. Tree cover has been suggested to mitigate the negative effects of ALAN on bats by shielding areas against light scatter. Here, we investigated the effect of tree cover on the relationship between ALAN and bats in Berlin, Germany. In particular, we asked if this interaction varies with the UV light spectrum of street lamps and also across urban bat species. We expected trees next to street lamps to block ALAN, making the adjacent habitat more suitable for all species, irrespective of the wavelength spectrum of the light source. Additionally, we expected UV emitting lights next to trees to attract insects and thus, opportunistic bats. In summer 2017, we recorded bat activity at 22 green open spaces in Berlin using automated ultrasonic detectors. We analyzed bat activity patterns and landscape variables (number of street lamps with and without UV light emission, an estimate of light pollution, and tree cover density around each recording site within different spatial scales) using generalized linear mixed-effects models with a negative binomial distribution. We found a species-specific response of bats to street lamps with and without UV light, providing a more detailed picture of ALAN impacts than simply total light radiance. Moreover, we found that dense tree cover dampened the negative effect of street lamps without UV for open-space foraging bats of the genera Nyctalus, Eptesicus, and Vespertilio, yet it amplified the already existing negative or positive effect of street lamps with or without UV on Pipistrellus pipistrellus, P. pygmaeus, and Myotis spp. Our study underpins the importance of minimizing artificial light at night close to vegetation, particularly for bats adapted to spatial complexity in the environment (i.e., clutter-adapted species), and to increase dense vegetation in urban landscape to provide, besides roosting opportunities, protection against ALAN for open-space foraging bats in city landscapes. By 2050, the human population is expected to reach almost 11 billion individuals, of which over 70% will live in cities (UN-Habitat, 2010; United Nations Population Division, 2013). The increasing density of human activities in urban areas leads cities to turn into local or even regional centers for artificial light at night (ALAN) (Kyba et al., 2014). Artificial light is considered a threat to biodiversity given its encompassing impact on nocturnal wildlife (Rich and Longcore, 2006; Hölker et al., 2010). Impacts range from constrained foraging, altered reproduction and impaired communication (Gaston et al., 2013) to a complete shift in trophic interactions and species communities (Arlettaz et al., 2000; Knop et al., 2017; Manfrin et al., 2018). While various human activities contribute to ALAN such as illuminated (advertising) signs, automobile headlights, aesthetic lighting of buildings, and searchlights (Kyba et al., 2014), street lamps are arguably the most dominant and direct light sources in urban areas (Gaston et al., 2012; Kyba et al., 2014). Street lamps vary in their wavelength spectrum and can be grouped into light sources with a broad or narrow wavelength spectrum (Elvidge et al., 2010). While some broad-spectrum lamps such as mercury vapor or metal halide emit light in the ultraviolet (UV) wavelength spectrum (ranging from 100 to 400 nm; Elvidge et al., 2010) other broad-spectrum lamps, such as regular light emitting diodes (LEDs) used conventionally for lighting streets do not emit light in the UV spectrum (Elvidge et al., 2010). Street lamps emitting UV light provoke discourses given their impact on nocturnal wildlife including the cascading effect on simple food chains (Wakefield et al., 2016; Manfrin et al., 2018). However, with the pressure to reduce energy use and CO2, communal authorities are replacing energy intensive lamps such as high-pressure mercury lamps to energy saving light-emitting diode (LED) or metal halide lamps (Elvidge et al., 2010; Gaston et al., 2012). This is likely to have an impact on urban biodiversity, including bats (Rowse et al., 2016; Lewanzik and Voigt, 2017; Voigt et al., 2018b). How bats respond to ALAN is species and context specific (Stone et al., 2015). While direct lighting on buildings in which bats roost have a profound negative effect on behavior and reproduction (Downs et al., 2003; Boldogh et al., 2007; Rydell et al., 2017), direct lighting of streets can benefit some opportunistic bat species with respect to foraging as they take advantage of concentrated prey insects lured by street lamps (Rydell, 1992; Blake et al., 1994; Gaisler et al., 1998). As earlier studies have shown, the response of bats to light while foraging and commuting likely depends on their wing morphology and echolocation: fast-flying bats with long range echolocation pulses (e.g., from the genera Eptesicus, Nyctalus, Vespertilio, and Pipistrellus) appear to be less affected by ALAN whereas slow-flying bats (e.g., Myotis) with echolocation adapted for cluttered environments (i.e., adapted to environments with high spatial complexity; Fenton, 1990) avoid street lights, potentially due to light-dependent predation risk (Stone et al., 2015; Rowse et al., 2016). In addition, bats might show different responses to street lamps with UV light irrespective of prey availability at these street lamps, given that shorter wavelengths in the UV spectrum attract larger moths (van Langevelde et al., 2011). Although UV vision may be widespread in bats (Winter et al., 2003; Gorresen et al., 2015), UV sensitivity might differ among taxa (Zhao et al., 2009). Hence, while some bat species may take advantage of foraging around street lamps with UV light (e.g., mercury vapor and metal-halide lamps), other species that can perceive UV light, e.g., some species of the genus Myotis (Gorresen et al., 2015), might be disturbed by UV light emission. While the body of research on bats and ALAN is growing (Stone et al., 2015; Rowse et al., 2016), the relationship between urban tree cover and ALAN has received little attention so far. The few studies that have investigated ALAN in relation to tree cover report that trees might mitigate to some degree the potential negative effect of ALAN on commuting bats (Mathews et al., 2015) or a negative impact of ALAN on the habitat quality of urban tree patches for particularly urban sensitive bat species (Threlfall et al., 2013). Nevertheless, we still lack a detailed understanding of the impact that urban trees have on the relationship between bats and ALAN. Further, various measurements of ALAN have been used in this growing body of research. For instance, some studies used a broad estimate of ALAN from satellite based data such as “Visible Infrared Imaging Radiometer Suite” or “Visible and Near-Infrared” (Azam et al., 2016; Straka et al., 2016; Pauwels et al., 2019) to investigate the impact of ALAN on bats in the urban environment. Other studies investigated the response of bats to ALAN on a street lamp level by comparing different types of light sources (e.g., Lacoeuilhe et al., 2014; Lewanzik and Voigt, 2017), light colors (e.g., Spoelstra et al., 2017) or the number of street lamps (Blake et al., 1994). Both measurements have their advantages and shortcomings in studying the impact of ALAN on urban wildlife. While satellite-based data can show important areas emitting light at night into space, the visibility of direct and dominant light sources on the street level can be blocked by tall buildings and vegetation (Kyba et al., 2014). In contrast, street lamps might provide an overview of light pollution on the local scale level, particularly whether lamps are emitting UV or not, but overlook the impact of light from other areas e.g., private estates in the urban environment. Consequently, the aims of this study were to (1) investigate the effect of ALAN on bat activity, from the local scale at street lamps (with and without UV) to a broad estimate of light from satellite data, and (2) whether tree cover influences the relationship between ALAN and bats in urban landscapes. Berlin provides an ideal study area to investigate the relationship between ALAN, tree cover and urban bats. Thus far, 18 out of the 25 species recorded in Germany have been observed in Berlin, ranging from synanthropic species to migrating bats and forest specialists. About 20% of Berlin's urban area is covered by forest including large patches such as the “Grunewald” (Stillfried et al., 2017). 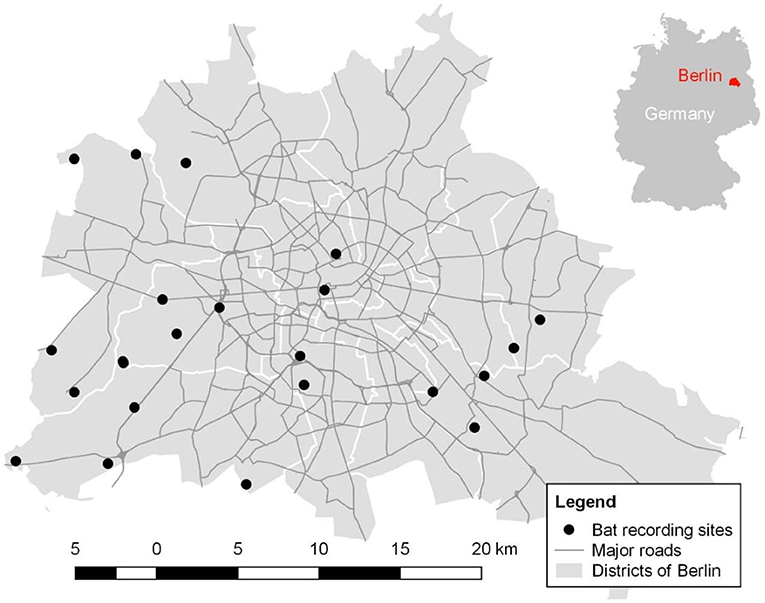 The specific history of Berlin as a formerly divided city governed by different authorities caused large-scale area-specific concentrations of certain lighting technologies (Kuechly et al., 2012). As a consequence, Berlin streetlights include both UV emitting light sources such as mercury vapor and metal halide and non-UV emitting light sources such as light-emitting diodes (Elvidge et al., 2010; Gaston et al., 2012). We hypothesized that bats would show a species-specific response to street lamps with and without light in the UV wavelength range, mirrored in the broad estimate of light from satellite data. We further hypothesized that bats would be more active in lit areas with high tree cover, compared to areas with low tree cover given that insects from the vegetation might be lured by the street light, particularly when UV emitting light sources are present, and tree cover might mitigate the direct radiance of ALAN on bats. Understanding the impact of ALAN on bats and whether urban trees can mitigate potential negative effects is critical for the conservation of urban bat populations in the future. This is particularly true if we intend to contribute to biologically diverse cities which provide habitat not only for people, but also for nocturnal wildlife. We conducted our study in Berlin (52°52′N and 13°41′E), Germany in 2017. Berlin encompasses an area of 892 km2 and is home to approximately 3.7 million people (Amt für Statistik, 2017). We selected 22 open green areas (Figure 1) within the city boundaries, which were similar in their structure but differed in their urban surrounding and intensity of ALAN. In general, selected sites consisted of dry grassland (i.e., open green areas with short plant cover and open soil patches. Grass is mowed at the most once a year; hence, the management of these sites is very limited) with bushes and trees in vicinity. Average size of our study sites was 7,000 m2. We selected these habitats given that dry grasslands are very abundant in Berlin and widely distributed across the city (Senatsverwaltung für Umwelt, 2014). Furthermore, open green areas provide important bat habitat (Straka et al., 2016), and in particular dry grasslands are one of the focal biotope types in nature conservation and strictly protected by national law (Finck et al., 2017). Dominant trees (on average 15 m tall and >75% whenever trees were present) and bushes (≤3 m) at the vicinity were Fagus sylvatica, Pinus sylvestris, and Quercus robur in rural sites and Acer plantanoides, A. pseudoplantanus, Betula pendula, and Robinia pseudoacacia in more urban site. Figure 1. Spatial distribution of the 22 study sites across the districts in Berlin outlined by white borders. Gray lines indicate major streets and highways. Between June and August 2017, we recorded bat echolocation calls with Batcorders (v.2.0, ecoObs GmbH Nuremberg, Germany) 1 week before and 1 week after new moon to avoid the influence of moon light on bat activity (Heim et al., 2016). Batcorders had a sample rate of 500 kHz (16 bit) and were set to a sound pressure level threshold of−36 dB, a frequency threshold of 16 kHz and a post-trigger time of 800 ms (following Heim et al., 2016). With this setting, even silent calls of Berlin's bat species could be recorded for at least 800 ms, once a recording was triggered above the sound pressure level and the frequency threshold. Each site was surveyed once in each month and four to five sites simultaneously in one night. At each site, one detector was set up on a tarp pole at 3 m height in the center of each site and at a maximum distance (at least 5 m) to any present water body or linear structure such as trees or roads. All microphones were calibrated before each survey and programmed to start recording at sunset and to stop at 2.5 h after sunset. Surveys took place on mild nights (>10°C ambient temperature), without rain and low wind speeds (visual assessment with ≤ small branches moving, which according to the Beauford scale is a maximum speed of 3.4–5.4 m/s). Temperature, relative humidity, dew point and wind speed were measured at each site in each survey night, using data loggers (EasyLog EL USB-2 +, Lascar electronics) and an anemometer (Thermo-hygro-anemometer pce-tha 10, PCE Institut) and averages calculated per night. Given the high correlation among variables, only ambient temperature and wind speed were used in further analyses. Recorded bat calls were semi-automatically analyzed. We used the software bcAdmin 2.0 to identify the presence of bat calls. Species identification was conducted automatically with the software batIdent 1.03 (both softwares: ecoObs GmbH, Nuremberg, Germany). Given that automatic species identification has a risk of misidentification (Russo and Voigt, 2016; Rydell et al., 2017), we randomly selected 1,000 calls from all species/groups and study sites and analyzed them manually using SASLab Pro (Avisoft Bioacoustics, Berlin, Germany). Manual analyses revealed that calls from Pipistrellus pipistrellus, P. nathusii, P. pygmaeus, and Nyctalus noctula were assigned correctly with the software batIdent if automatically assigned ≥89% to this species. Whereas, calls assigned <89% to these species and all other calls were manually checked. Where one recording contained bat calls from two different bat species, both species were considered. Bat calls which could not be identified were considered in the calculation of total bat activity. Given that some species cannot be distinguished with certainty based on their echolocation calls, they were combined into species complexes: the group NEV (calls from Nyctalus spp., Eptesicus spp., and Vespertilio murinus) and Myotis spp. (calls from Myotis species). Four landscape-scale measures of urbanization were calculated around each of the 22 tarp pole locations using QGIS version 2.14 [QGIS Development Team (2016)] and R version 3.3.3 (R Core Team, 2017) within 100, 500, and 1,000 m radii, namely (1) tree cover (percentage coverage of tree canopy, COPERNICUS PROGRAMM, 2017a) to estimate the share of natural landscape elements, (2) roads to estimate the share of linear landscape elements (Fis-Broker, 2017a), (3) impervious surfaces (incl. roads, COPERNICUS PROGRAMM, 2017b) to estimate the share of anthropogenic/build-up landscape elements, and (4) aerial observation of light pollution [high resolution (1 m2) mosaic image of the city of Berlin, (Kuechly et al., 2012)]. Given the high correlation among variables (≤-0.6 and ≥0.6), impervious surface and roads were excluded from further analyses. To estimate the influence of street lamps with UV and no UV around each tarp pole location, we quantified the number of different street lamp types such as mercury vapor (MV), metal halide (MH), and light-emitting diodes (LED), using ArcGIS (version 10.3, ESRI, Redlands, California, USA) within the radii 500 and 1,000 m (unpublished data Senate Department for the Environment, Transport, and Climate Protection, Berlin; Fis-Broker, 2017b). Street lamps within a radius of 100 m could not be considered given that we had several zero counts of street lamps within this radius. While mercury vapor (white color) and metal halide (white color) lamps have high emissions of UV, light emitting diodes (LEDs, white color) do not emit any UV light (Elvidge et al., 2010; Davies et al., 2013; Gaston et al., 2013; Rowse et al., 2016). Therefore, mercury vapor lamps and metal halide lamps were combined in the data set as street lamps emitting UV light compared to LED lamps that were considered as street lamps lacking UV light emission. Nevertheless, the commonality among these street lamps is that they are all broad-spectrum lamps (Elvidge et al., 2010; Davies et al., 2013). Based on R 3.3.3 (R Core Team, 2017), we used GLMMs with a negative binomial distribution using the package MASS (Venables and Ripley, 2002, Fourth Edition). The response variables were activity minutes of the five bat species/groups (P. nathussi, P. pipistrellus, P. pygmaeus, NEV, and Myotis spp.). Activity minutes were calculated as in previous studies (Heim et al., 2016; Lewanzik and Voigt, 2017) by splitting the survey time of 150 min (2.5 h) into 1-min intervals. Whenever a bat was active during one of the 150 intervals, it was counted as one activity minute. Using this approach, we minimized the inherent overestimation of bat activity when a bat circles around a detector. For each species (group), we modeled the activity as a function of the fixed factors “tree cover,” “light pollution,” and street lamps with “high UV” (mercury vapor and metal halide combined) and “no UV” (LED lamps) and the interaction between “tree cover” and the three light variables. We considered for “tree cover” the three buffer zones (100, 500, and 1,000 m) and for the three light variables two buffer zones (500 and 1,000 m) given the missing values at 100 m. While this first model was representing the landscape variables, we separately modeled the activity of each species (group) to temperature and wind speed, representing their response to ambient conditions. Study site was included as a random factor and thus captured unintentional local variation. The locations did not show any spatial dependency, hence no correction for spatial autocorrelation was necessary (spaMM, Rousset and Ferdy, 2014). All numeric variables were centered and standardized (mean of zero and standard deviation of one) to improve convergence of the fitting algorithm and to put the estimated coefficients on the same scale, allowing the comparison of effect sizes (Rhodes et al., 2009). We tested for temporal autocorrelation (DHARMa, Hartig, 2018) using the landscape model for each bat species/group. Except for P. pygmaeus, we did not detect temporal autocorrelations (Durbin-Watson test: P. nathusii: DW = 2.5, p = 0.97, P. pipistrellus: DW = 1.7, p = 0.08, P.pygmaeus: DW = 1.2, p < 0.001, P. pygmaeus: DW = 1.2, p < 0.001, NEV: DW = 1.7, p = 0.09, Myotis spp. : DW = 1.8, p = 0.16, total bat activity: DW = 1.7, p = 0.14) among the survey months June, July, and August. We created an initial set of generalized linear mixed models (GLMMs, Bates et al., 2015) with binomial distribution covering all combinations of scales at which the variables “tree cover,” “light pollution,” “high UV,” and “no UV” were extracted. Thus, each model contained 4 variables, each derived at one scale, with the interaction term between tree cover and the three light variables. Then, we applied a multi-model inference procedure (“MuMIn,” Barton, 2018). As the lowest delta AICc were less than four, we decided to calculate the relative variable importance values based on all candidate models (proportion of models including the variable vs. models excluding the variable out of the best set of models). Variables with relative importance values >0.6 were selected for the final models (see Appendices 1, 2). Finally, we calculated for each model the explained deviance (deviance reduction: [(deviance of null model –deviance of final model)/deviance of null model] × 100). We plotted the modeled predictions and confidence intervals (95%) of single variables for each bat species/group and total bat activity, scaling activity minutes to allow for comparison among species (ggplot2, Wickham, 2016). In total, we recorded 11,157 bat calls which equates to 4,880 recording minutes (total bat activity) of which 3,756 min could be assigned to the five species categories: P. pipistrellus, P. nathusii, P. pygmaeus, Myotis spp., and NEV group. The remaining 1,124 recording minutes consisted of unidentified bat calls. Bats belonging to the NEV group (Nyctalus spp., Eptesicus spp., Vespertilio murinus) were recorded most frequently followed by P. pipistrellus, both of which were recorded at all study sites. Although, P. pygmaeus was recorded at only 77% of all study sites, it was the third most frequently recorded species. Both, P. nathusii and Myotis spp. were recorded at 86% of all study sites (Table 1). Table 1. Total activity minutes and relative portion of all 22 sites in which the corresponding species categories were recorded (decreasing order). Light pollution—as estimated from all light sources—was a positive predictor for the activity of bats from the NEV group, P. pipstrellus, and P. pygmaeus, and for total bat activity. Light pollution had the strongest positive effect on the activity of P. pipistrellus (activity minutes were 33 times higher in areas with the highest levels of light pollution compared to areas without any light pollution, Table 2). 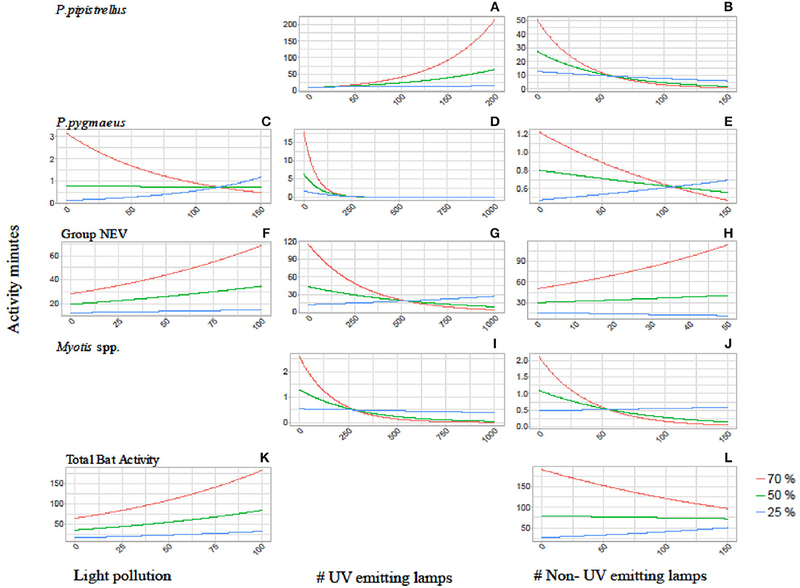 We observed divergent results for the response of bat species groups to street lamps with high UV light emission compared to no light without UV light emission (Table 2). While the activity of two of the pipistrelles, P. pipistrellus and P. nathusii, increased with an increasing number of UV emitting street lamps (activity minutes increased 56 times and 35 times, respectively, with the increasing number of UV emitting street lamps within the respective buffer zones; however, with a high uncertainty for P. nathusii), the other species and bats from the NEV group responded negatively to the increasing number of UV emitting street lamps, with the strongest negative effect found for P. pygmaeus (activity minutes decreased several thousand times (i.e., 27,249) with the increasing number of UV emitting street lamps within the respective buffer zone). In addition, street lamps lacking UV light had a strong negative effect on the activity of P. pipistrellus, P. nathusii, Myotis spp. (activity minutes decreased 28 times, 6 times, and 323 times, respectively, with the increasing number of street lamps lacking UV light within the respective buffer zones), a small negative effect on bats from the group NEV and a small positive effect on total bat activity. In contrast, P. pygmaeus showed no response, yet with a relatively high mean variation (Table 2), to street lamps without UV light emission. The effect of light variables was most influential at the 1,000 m scale, except for P. pipistrellus for which we observed the strongest effect for the 500 m buffer zone for UV emitting street lamps. For P. nathusii and bats from the NEV group, we recorded the strongest effect for the 500 m buffer zone for street lamps lacking UV light and for P. pygmaeus for the 500 m buffer zone for total light pollution (Table 2). Table 2. Effect sizes (±SE) derived from GLMMs with a negative binomial distribution at the landscape scale (n = 22 study sites). Tree cover was a strong positive predictor for all modeled species groups and total bat activity, with the strongest positive effect observed for bats from the NEV group. The positive effect of tree cover on bat activity was best explained at a 500 m scale, except for P. nathusii and P. pipistrellus for which tree cover at a spatial scale of 100 m buffer was most relevant (Table 2). The deviance reduction for our models ranged between 3% for P. nathusii and 15% for P. pygmaeus (Table 2). The relationship between bat activity and ALAN varied according to tree cover density, which was also relevant at different spatial scales (Figure 2). We observed strong interaction effects between tree cover and light variables for P. pipistrellus, P. pygmaeus, and Myotis spp. For P. pipistrellus and Myotis spp., this interaction effect was also present for both light sources, i.e., with UV and without UV light emission, whereas such an effect was only found for UV light and total light pollution for P. pygmaeus (Table 2). Weaker interacting effects between tree cover and light variables were found for bats from the NEV group and total bat activity and none for P. nathusii (Table 2). Figure 2. Interaction plots showing the activity of P. pipistrellus (A,B), P. pygmaeus (C–E), Group NEV (F–H), Myotis spp. (I,J) and total bat activity (K,L) in relation to the three tree cover densities (red = 70%, green = 50%, blue = 25%) and the three light variables: overall light pollution (left side graphs), number of UV emitting street lamps (mid graphs) and number of non-UV emitting street lamps (right side graphs). Blank sections indicate that the interaction between tree and light variables were not found to be relevant for the final model (see Appendices 1, 2). The activity of P. pipistrellus increased strongly in areas with high tree cover (70% within a 100 m buffer) and a high prevalence of UV emitting street lamps (activity minutes increased 54 times with the increasing number of UV lamps from 0 to 200, Figure 2). This effect was modest (11-fold increase) to small (1.4-fold increase) in areas with moderate (50%) compared to low (25%) tree cover, respectively. In contrast, the activity of P. pipistrellus decreased strongly in areas with high tree cover and an abundant number of street lamps without UV light emission. In detail, in areas with high tree cover, the activity of P. pipistrellus decreased more with the increasing number of lamps without UV light (from 0 to 150) compared with areas that had moderate or low tree cover (50-fold, 5.6-fold, and 2-fold decrease, respectively). Pipistrellus pygmaeus was negatively impacted by the presence of street lamps with UV light emission (Table 2). This negative impact was intensified in areas with high tree cover (70% within a 500 m buffer) while less strong in areas with moderate (50% within a 500 m buffer) and low (25% within a 500 m buffer) tree cover (activity minutes decreased 17- fold, 6-fold, and 2-fold, respectively, with the increasing number of UV street lamps from 0 to 250, Figure 2). Irrespective of UV emission, the negative effect of both street lamp types on the activity of Myotis spp. was intensified in areas with high and moderate tree cover. Within a 500 m buffer, activity minutes of bats decreased 22 and 6 times at high to moderate cover, under both scenarios with increasing number of street lamps with and without UV (Figure 2). While bats from the group NEV were less active overall in areas with low tree cover compared to high tree cover, we observed an increase in activity (2.2 times) in areas with high density tree cover and an increasing number of light without UV light emission (Figure 2). We found less obvious interaction effects between light and tree cover for the remaining scenarios (Figure 2). The response of P. pygmaeus in relation to light pollution and street lamps without UV light differed in relation to tree cover density (Table 2, Figure 2). Here, the positive or neutral response of bats to light pollution or street lamps lacking UV light emission was only found in areas with low tree cover, while the activity decreased in areas with high tree cover and with light sources lacking UV light. No clear interacting effects were found between light and tree cover for total bat activity (Figure 2). Wind speed had a negative impact on all modeled bat species/groups and total bat activity, except for a small positive effect on P. pipistrellus, while bat activity increased with ambient temperature for all species (Table 3). Table 3. Effect sizes (± SE) for wind speed and temperature derived from GLMMs with a negative binomial distribution. Artificial light at night (ALAN) is a threat to biodiversity (Hölker et al., 2010; Gaston et al., 2013) particularly for strictly nocturnal taxa such as bats (Stone et al., 2015; Rowse et al., 2016; Voigt et al., 2018b). However, the relationship between bats and light is species and context specific and some bat species are able to forage concentrated insects attracted by street lamps (Rydell, 1992; Blake et al., 1994; Gaisler et al., 1998). Here, we show that urban bats in Berlin exhibit species-specific responses to street lamps depending on whether or not lights emit light in the UV wavelength spectrum. Thus, our study aimed at a more detailed picture of how ALAN impacts bats than a satellite-based estimate of overall light pollution (but see Pauwels et al., 2019). In addition, we provide novel insights into the importance of tree cover for all studied bat species (groups) in response to ALAN. Although wind speed and temperature were not the focus of the paper, results were consistent with the literature (Verboom and Spoelstra, 1999; Wolbert et al., 2014), with relatively strong winds having a negative and higher temperature a positive impact on bat activity. ALAN can influence bats at their roosts (Downs et al., 2003) and fragment commuting routes for some species with associated negative conservation consequences (Stone et al., 2009; Hale et al., 2015). Approximately one third (32%) of the light pollution in our study area was estimated to originate from streets, which included street lamps, automobile headlights and advertising lights, while the remaining two thirds originated from other urban land classes, including industrial regions, public service areas, block buildings, city center, open sports and leisure centers, railway facilities, and parks and green spaces (Kuechly et al., 2012). Hence, this light estimate filled the gap between street level data (and the distinction between street lamps with high UV and no UV) and other nighttime data of Berlin. We found a positive response of P. pipistrellus, P. pygmaeus, and bats from the NEV group (Nytctalus spp, Eptesicus spp., and Vespertilio murinus) to this estimate of light pollution. Although this aligns with previous findings about the relative tolerance of fast flying species toward ALAN (Lacoeuilhe et al., 2014; Stone et al., 2015), we were able to differentiate their responses to light with UV and no UV emissions due to the fine-scale street level data in our study. While there was a positive response to the overall estimate of light pollution when we focused on street level data, we found that P. pygmaeus and bats from the group NEV responded negatively to street lamps emitting UV light (mercury vapor and metal halide). In contrast, P. pipistrellus and P. nathusii were more active in areas with numerous UV emitting street lamps. In general, street lamps with UV emissions attract larger moths (van Langevelde et al., 2011), whose escape behavior has been shown to be negatively impacted by light (Acharya and Fenton, 1999). Hence, these types of lamps provide effective foraging grounds which reduce the hunting effort for bats (Acharya and Fenton, 1999; Rydell, 2006). In contrast, some species might be sensitive to UV emission (Zhao et al., 2009) and likely be disturbed by it (Gorresen et al., 2015). Since Lepidopterans are major prey items in the diet of P. pipistrellus and P. nathusii, (Arlettaz et al., 2000; Krüger et al., 2014), it is likely that these species take advantage of a concentration of larger moths around street lights with UV light emission. The fact that both, P. pipistrellus, and P. nathusii showed a negative response to street lamps without UV light underpins this assumption. In contrast, their congeneric species P. pygmaeus showed a strong negative response to street lamps emitting UV light. Since small dipterans, mostly around water, are the main food items of this species (Bartonička et al., 2008), they might be less attracted to street lamps with high UV light emission. However, the strong negative response of this species to these lights suggests a sensitivity for UV light in this species. Slow-flying Myotis spp showed a strong negative reaction toward both street lamp types which confirms the overall light sensitivity of this genus (Stone et al., 2015; Straka et al., 2016; Lewanzik and Voigt, 2017), including the sensitivity toward UV emission (Gorresen et al., 2015). Overall, street lamps without UV emission (LED lamps) showed no positive effect on the activity of any bat species or species groups. This aligns with the theory that bats do not use, but rather avoid, lit areas unless it provides an attractive foraging ground given that light may increase predation risk and negatively affect orientation abilities (Rydell and Speakman, 1995; McGuire and Fenton, 2010). Interestingly, all light variables were predominantly influential on a large scale (1,000 m) without much difference between street lamp types. Such a pattern highlights the importance of landscape-wide and not only local habitat features and points out to the consideration of large-scale effects in the development of lighting schemes for urban areas. Trees are important habitats for bats in almost all landscapes (Kalcounis-Rüppell et al., 2005), particularly in urban environments where roosting options for tree-dwelling bats might be limited (Threlfall et al., 2016). Besides roosts, trees also provide shelter, landmarks for orientation or foraging sites (Verboom and Spoelstra, 1999). They might also reduce the negative impacts of ALAN by shielding dark areas against light spillage (Mathews et al., 2015) and mitigating the impacts of ALAN on bat roosts in buildings (Downs et al., 2003). In our study, tree cover was a positive predictor for all modeled bat species (groups) within the immediate 100 m (P. pipistrellus and P. nathusii) or 500 m buffer zone (all other bats). Trees are not only relevant for clutter-adapted species (as in our study Myotis spp.) but also for edge-adapted species, such as P. pygmaeus, P. pipistrellus as well to some degree P. nathusii (Zahn et al., 2008) that use vegetation for foraging or commuting. The consistent positive effect of tree cover on all modeled bat species groups confirms that managing urban trees is a nature conservation strategy delivering meritorious rewards (Endreny et al., 2017). Tree cover has been suggested to mitigate the effect of ALAN on bats (Rydell, 2006; Mathews et al., 2015). To verify this, we expected that bat species would be more active in lit areas with high tree cover compared to areas with low tree cover (i.e., trees would mitigate the negative effect of light on bat activity). We found this pattern for bats from the NEV group in relation to light without UV emission (LED) in particular. We consider this to be a mitigating effect which may not be a direct response to higher insect abundance close to vegetation, given that LED lights attract fewer insects (Wakefield et al., 2016). Nevertheless, this relationship warrants further investigations. More often, however, we found that high levels of tree cover were intensifying the already existing relationship between light and bats, as in the case of P. pipistrellus (high UV and no UV lights), P. pygmaeus, (light pollution and high UV lights) and Myotis spp (high UV and no UV lights). For instance, P. pipistrellus was found to be more active in areas with high tree cover density and abundant high UV street lamps but less in highly treed areas with numerous non-UV (LED) lights. An explanation for this pattern could be an increased insect abundance in areas with high tree cover and UV light emission and hence, attractive foraging grounds, whereas lit and highly treed areas without UV light emission might simply be less preferred by this species because insects do not aggregate and are thus more difficult to capture. In contrast, P. pygmaeus responded negatively to street lamps with high UV emission in highly vegetated areas which may again confirm the UV sensitivity of this bat species. Irrespective of high UV or no UV emission, Myotis spp. responded stronger to the negative effect of both street lamp types in highly vegetated areas. Since woodland and riparian habitats are preferred habitats by P. pygmaeus and vegetated areas for Myotis spp. (Russo and Jones, 2003; Meschede and Rudolph, 2004), the removal of lamps close to these habitats seem particularly essential for these species, particularly those with UV light emission for P. pygmaeus. Hence, minimizing ALAN close to vegetation and adding no further light would benefit particularly P. pygmaeus and Myotis spp. Furthermore, in highly lit areas increased vegetation cover is likely to not only mitigate direct impacts of light on bat activity, but also decrease the spill-over effect of sky glow on high flying bats (Voigt et al., 2018a) which are represented in the NEV group. We found that although the two congeneric pipistrelles, P. pipistrellus and P. pygmaeus, responded positively to overall light intensities, P. pygmaeus was particularly sensitive to street lamps with UV light emission. In order to gain a deeper understanding of why some species are more successful, or as in this case less sensitive to certain light sources, than others it is essential to carry out more detailed assessments than just activity patterns (McDonnell and Hahs, 2015). Further studies investigating the differences in flexibility of close related synanthropic species in the urban environment in relation to their diet, morphology, foraging, roost selection, stress resistance and reproduction success are therefore essential. Acoustic surveys have their limitations as they can underestimate the activity of bats with weak echolocation calls such as Myotis spp. (O'Farrell and Gannon, 1999). In contrast, bats with very loud echolocation calls such as Nyctalus noctula can be recorded from afar (more than 100 m) which are represented in the group NEV. Furthermore, given that we did not check for feeding buzzes, our data might include both commuting and foraging bats. We did not include high pressure sodium vapor (HPSV) lights in our analyses although these street lamps types are distributed across Berlin. High pressure sodium vapor lights emit a moderate level of UV (Elvidge et al., 2010) and we wanted to strictly focus on street lamps with high vs. low UV light emission. Nevertheless, a study in France found, that P. pipistrellus is taking advantage of (foraging at) full-time lighting at HPSV lamps (Azam et al., 2015), while in the UK, the same species has been found to avoid lit gaps in the urban environment when sodium vapor street lamps were present (Hale et al., 2015). While these light types might warrant further investigations, these earlier most commonly used light types in Europe (Eisenbeis, 2006) are slowly being replaced in urban areas and metal halide (high UV) street lamps (Elvidge et al., 2010; Gaston et al., 2012). Hence, it is more critical to understand the response of bats to these light types. Cities will sprawl with the growth of human population. Around 30% of all vertebrates and more than 60% of all invertebrates are nocturnal (Hölker et al., 2010) and managing the negative effects of ALAN on biodiversity is critically one of the highest priorities for conservation of nocturnal wildlife. Effective bat conservation in cities includes an understanding of how to manage ALAN in urban areas (Voigt et al., 2018b). Our study highlights that bats respond species-specifically to ALAN and benefit from urban trees patterns separately reported in literature (Stone et al., 2015; Threlfall et al., 2016). The novelty of this study consists of the observation that trees influence the relationship between bats and ALAN. This suggests that first, it is important to consider the potential interaction between tree cover and ALAN given that both variables might not tell the complete story when considered isolated. Second, and more importantly, our study emphasizes that trees are important for urban bats. Hence, light should be avoided close to habitats with trees. Human activity requires light which consequently needs the wise management of ALAN. Lights with UV appears to be redundant given that UV components in light might not be needed anyway as non-functional for humans, but harm to a wide range of urban wildlife (Mathews et al., 2015). LED light sources (cold-white color) and widespread use of broad spectrum metal halide (MH) are heavily criticized given their strong blue light emission which produces an increase of light pollution in the atmosphere (Falchi et al., 2011). While most decisions about street lamps might have economic reasons, it is further critical to provide evidence that optimal management of already existing light sources contribute to biodiversity conservation (Hölker et al., 2010) including functioning ecosystem services (Lewanzik and Voigt, 2014). Education (e.g., with information that is tailored to address people's environmental value orientations) about the threat of ALAN on biodiversity might be crucial for an ongoing support of the public light management strategies as a study in the Netherlands has shown (Boomsma and Steg, 2014). Further, with the ongoing advancements of satellite-based light measurements, we will gain a deeper understanding about the effect of ALAN on biodiversity landscape scales. This and the wise management of ALAN such as avoiding light in areas that are of high habitat quality, adding trees in highly lit areas, or turning off lights when the area is not in use (Falchi et al., 2011) are arguably the most critical contributions to bat conservation in the new era of the Anthropocene. CV, MW, PG, and SB designed the research of this manuscript. CV, PG, and SB advised the student. MW and SB generated the data. MW analyzed the bat calls. TS, MW, and PG prepared and analyzed the data. TS, PG, and CV wrote the manuscript. All authors contributed to manuscript editing and approved the final version of the manuscript. This work, PG and SB were funded by the German Federal Ministry of Education and Research BMBF within the Collaborative Project Bridging in Biodiversity Science-BIBS (funding number 01LC1501A-H). We thank the Senate Department for the Environment, Transport and Climate Protection for the provision of the street lamp data. Furthermore, we thank all helpers during the data collection. Amt für Statistik (2017). Statistischer Bericht – Einwohnerinnen und Einwohner im Land Berlin am 30. Juni 2017. Potsdam: Berlin-Brandenburg. Barton, K. (2018). MuMIn: Multi-Model Inference. R Package Version 1.40.4. Available online at: https://CRAN.R-project.org/package=MuMIn (accessed January 26, 2018). COPERNICUS PROGRAMM (2017a). Forests. Available online at: http://land.copernicus.eu/pan-european/high-resolution-layers/forests/view (accessed October 14, 2017). COPERNICUS PROGRAMM (2017b). Imperviousness. Available online at: http://land.copernicus.eu/pan-european/high-resolution-layers/imperviousness/view. Eisenbeis, C. (2006). “Artificial night lighting and insects: attraction of insects to streetlamps in a rural setting in Germany,” in Ecological Consequences of Artificial Night Ligthing, eds C. Rich and T. Longcore (Washington, DC: Island Press), 191–198. Finck, P., Heinze, S., Raths, U., Riecken, U., and Ssymank, A. (2017). Rote Liste der Gefährdeten Biotoptypen Deutschlands: Dritte Fortgeschriebene Fassung 2017. Bonn: Bundesamt für Naturschutz, 637. Fis-Broker (2017a). Geoportal Berlin /Flaechennutzung, Stadtstruktur 2015 und Versiegelung 2016. Berlin: Umweltatlas. Fis-Broker (2017b). Elektrische Beleuchtung. Berlin: Umweltatlas. Hartig, F. (2018). DHARMa: Residual Diagnostics for Hierarchical (Multi-Level / Mixed) Regression Models. R Package Version 0.1.6. Available online at: https://CRAN.R-project.org/package=DHARMa (accessed January 26, 2018). Meschede, A., and Rudolph, B. (2004). Fledermäuse in Bayern. Hrsg: Bayer. Landesamt für Umweltschutz, Landesbund f. Vogelschutz (LBV) und Bund Naturschutz in Bayern (BN). Stuttgart: Eugen Ulmer Verlag. QGIS Development Team (2016). QGIS Geographic Information System. Open Source Geospatial Foundation Project. R Core Team (2017). R: A Language and Environment for Statistical Computing. Vienna: R Foundation for Statistical Computing. Available online at: https://www.R-project.org/ (accessed January 26, 2018). Rich, C., and Longcore, T. (2006). Ecological Consequences of Artificial Night Lighting. Washington, DC: Island Press. Rydell, J. (2006). “Bats and their insect prey at streetlights,” in Ecological Consequences of Artificial Night Lighting, eds C. Rich and T. Longcore T (Washington, DC:Island Press), 43–60. Senatsverwaltung für Umwelt, Verkehr, und Klimaschutz. (2014). Biotoptypen. Umweltatlas Berlin. Available online at: http://www.stadtentwicklung.berlin.de/umwelt/umweltatlas/i508.htm (Accessed August 05, 2017). UN-Habitat (2010). State of the World's Cities 2010/2011: Bridging the Urban Divide. Nairobi: United Nations Human Settlements Programme (UN-HABITAT). United Nations Population Division (2013). World Population Prospects: The 2012 Revision, Key Findings and Advance Tables. Working Paper No. ESA/P/WP.227. Venables, W. N., and Ripley, B. D. (2002). Modern Applied Statistics With S, 4th Edn. New York, NYL Springer. Voigt, C.C, Azam, C., Dekker, J., Ferguson, J., Fritze, M., Gazaryan, S., et al. (2018b). Guidelines for Consideration of Bats in Lighting Projects. EUROBATS Publication Series No. 8. Bonn: UNEP/EUROBATS Secretariat, 62 p.
Zahn, A., Gelhaus, M., and Zahner, V. (2008). Die Fledermausaktivität in unterschiedlichen Waldtypen, an Gewässern und im Offenland–eine Untersuchung auf der Herreninsel im Chiemsee (Bayern). Forst und Jagdzeitung, 173–179. Copyright © 2019 Straka, Wolf, Gras, Buchholz and Voigt. This is an open-access article distributed under the terms of the Creative Commons Attribution License (CC BY). The use, distribution or reproduction in other forums is permitted, provided the original author(s) and the copyright owner(s) are credited and that the original publication in this journal is cited, in accordance with accepted academic practice. No use, distribution or reproduction is permitted which does not comply with these terms.